Roslyn school district principals and school board members honored retiring teachers and recognized students for recent music and math achievements at a meeting Wednesday night. 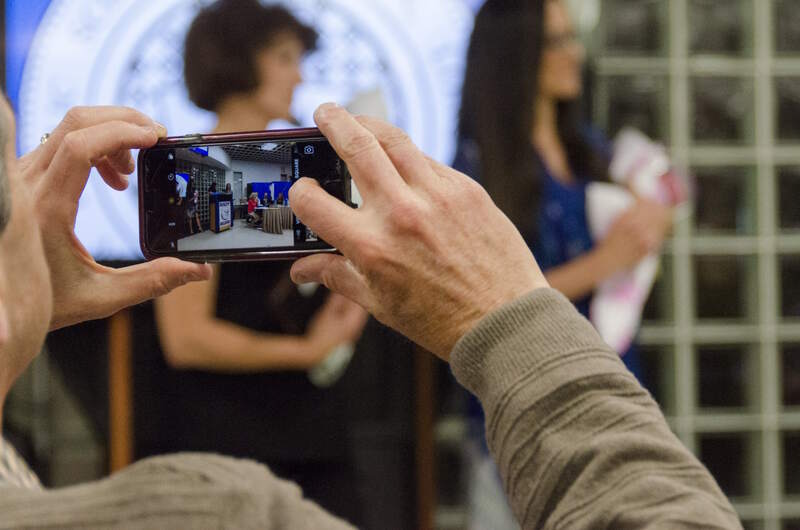 Eight teachers from East Hills School, Roslyn Middle School and Roslyn High School were honored with speeches by their principals and plaques from the school board thanking each educator for their years of dedication to Roslyn students. East Hills School principal Melissa Krieger spoke about special educators Barbara Antoniades and Felice Silverman, who collectively worked at Roslyn for 51 years. Some of Antoniades’ students said how helpful and caring she is when helping them with homework in subjects such as grammar, subtraction and counting coins. Silverman’s students commented on her friendly demeanor and how they always learn something new from her. Foreign language teacher Marissa Fulgoni, science teacher Mark Diercks, special educator Susan Gidwill and art teacher Harriet Spivack were honored in brief speeches by middle school principal Craig Johanson. The tenures of these four educators is more than 100 years in total. Johanson spoke about how Fulgoni and Spivack inspired their students by sharing their passions throughout their careers at Roslyn. He said Fulgoni loves to celebrate foreign language and discusses with her students not only where a country is but who lives there and what the culture is like. Johanson added that Spivack, who has been in charge of the school’s mural program for many years, has helped to make the building a piece of artwork. She said she speaks to students about different media and teaches them how to express themselves through art. When honoring Diercks and Gidwill, Johanson focused on their lasting impact on students. He said that when he speaks to alumni who are in their 40s or older and asks who their favorite teacher was or what they remember they most, they respond with Diercks’s name. Johanson called Diercks an “integral part” of the lives of not only former students, but current ones and colleagues as well. Gidwill was the only retiree to have a former student at the ceremony, which Johanson said spoke to what a “truly special person” she is and the effectiveness of acting as an advocate for each of her students. Gidwill will be a substitute teacher on Tuesdays, Wednesdays and Thursdays next year. Special educator Mardi Braun was honored by high school principal Scott Andrews, who shared stories from colleagues and students. A common theme among Braun’s fellow students was her tendency to go out of her way to help anyone who needed it, even if it meant taking on more work. Many of her students said Braun was able to help calm them down when they were stressed and seemed to care more about their success than sometimes they did. Andrews also briefly recognized music director Patrick Patterson, who was absent from the ceremony. 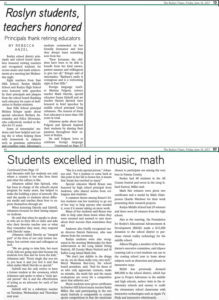 Roslyn students were also recognized at the meeting Wednesday for their achievement at the Long Island String Festival, All County Music Festival and Al Kalfus Long Island Math Fair. The Roslyn Times published this piece in print on Friday, June 16, 2017. Music students were given certificates by Harbor Hill School music teacher Kathy Miller. She said participating in the two music festivals is comparable to county sports competitions in that the musicians chosen to participate are among the very best in Nassau County. 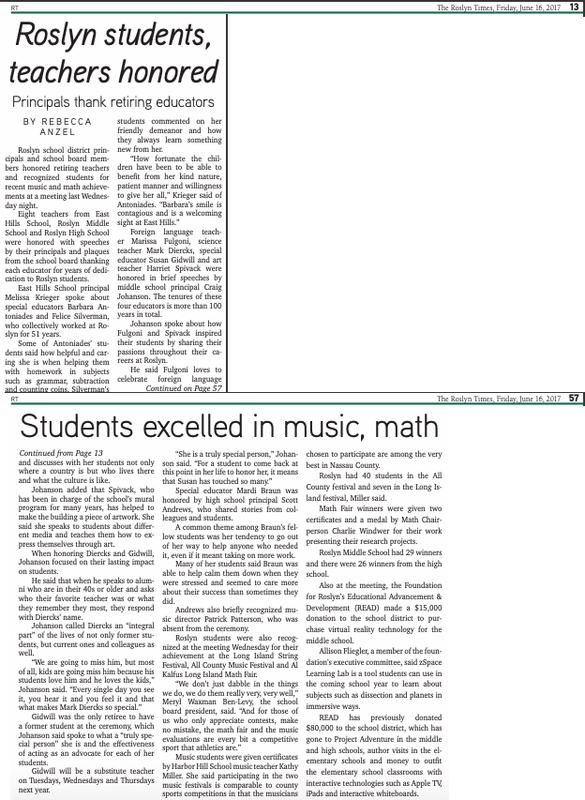 Roslyn had 40 students in the All County festival and seven in the Long Island festival, Miller said. Math Fair winners were given two certificates and a medal by Math Chairperson Charlie Windwer for their work presenting their research projects. Roslyn Middle School had 29 winners and there were 26 winners from the high school. Also at the meeting, the Foundation for Roslyn’s Educational Advancement & Development(READ) made a $15,000 donation to the school district to purchase a virtual reality technology for the middle school. Allison Fliegler, a member of the foundation’s executive committee, said zSpace Learning Lab is a tool students will be able to use in the upcoming school year to learn about subjects such as dissection and planets in immersive ways. READ has previously donated $80,000 to the school district, which has gone to Project Adventure in the middle and high schools, author visits in the elementary schools and money to outfit the elementary school classrooms with interactive technologies such as Apple TV, iPads and interactive whiteboards.